Jeep's U.S. deliveries, down 11 percent in March, have now dropped three straight months. **Reflects Aston Martin, Ferrari and Lotus sales estimates. The auto industry headed into the key spring selling season on a down note, with U.S. sales falling 3.1 percent in March. But there was bright spot in the month -- the seasonally adjusted, annualized rate of sales came in at 17.42 million, well above the forecast of 16.8 million, and up sharply from February's 16.61 million rate and even the 17.33 million pace set in March 2018. Among major automakers, only American Honda, Hyundai-Kia, Volkswagen Group and Subaru managed an increase last month, helped largely by continuing strong demand for light trucks. It was the third decline for the industry in as many months this year. Automakers are struggling to maintain a record pace that has seen annual sales totals top 17 million in every year since 2014. U.S. sales have now dropped 3.2 percent through March. "The industry had a tough first quarter but with spring finally starting to show its face and continued strong economic indicators, such as a boost in housing sales, lower lending rates and a strong labor market, we are confident that new vehicle sales demand will strengthen going forward," said Reid Bigland, head of U.S. sales for FCA US. Sales at FCA US fell 7.3 percent, its second straight monthly decline after 11 consecutive gains. Toyota Motor Corp. extended its monthly losing streak to five. General Motors, down an estimated 8.3 percent, is still looking for its first gain of 2019. Volume dropped 5.2 percent at Ford Motor Co., with car sales skidding 27 percent, according to the Automotive News Data Center. Nissan Motor Co. slid 7.2 percent and Mazda dropped 19 percent. FCA was dragged down by another weak month for Jeep, cars and minivans, even as pickup volume remained strong. Sales rose 15 percent at Ram, aided by a new Ram pickup and rich incentives. Deliveries fell 11 percent at Jeep, 5.7 percent at Dodge, 38 percent at Chrysler and 45 percent at Fiat, the company said. Jeep, FCA's top-selling brand and a key source of company profits, has now posted three straight monthly declines. Volume dropped 5.5 percent at the Ford division but rose 1.9 percent at Lincoln last month. At Toyota, March sales were off 3.5 percent on a 13 percent decline in cars and a 3.3 rise in light trucks. Sales fell 5.1 percent at the Toyota division and rose 8.2 percent at Lexus. Nissan saw declines in both car and truck sales. Deliveries fell 5.3 percent at the Nissan brand and 23 percent at Infiniti. In bucking the industry trend, American Honda said it posted record March car and light-truck deliveries at the Honda division. Overall, sales rose 4.1 percent at Honda and 6.4 percent at Acura. Sales also rose 1.7 percent at Hyundai, 10 percent at Kia and 6 percent at Subaru, all helped by expanded light-truck lineups. Volkswagen boasted a 14 percent gain on the strength of a 20 percent increase in crossover deliveries, driven by Tiguan and Atlas sales. The brand's car volume rose 8 percent as Jetta demand increased 65 percent. Mitsubishi recorded its best sales of any month since March 2004, as deliveries of the Outlander, Outlander Sport and Eclipse Cross crossovers propelled it to a 37 percent gain. GM said its first-quarter U.S. sales dropped 7 percent, with volume down 7.8 percent at Chevrolet, 4.4 percent at GMC, 8.7 percent at Buick and 2 percent at Cadillac. The company no longer releases monthly U.S. sales results. GM said its first-quarter U.S. car sales skidded 21 percent, with crossovers, SUVs and pickups accounting for more than 80 percent of the mix. In addition to Fiat, brands with product lineups dominated by cars continued to struggle: March sales dropped 17 percent at Mini and 18 percent at Smart. Among other luxury brands, sales rose 2.9 percent at BMW, 1.1 percent at Audi, 16 percent at Volvo, 0.5 percent at Porsche, 13 percent at Jaguar and 4.6 percent at Genesis, the second straight monthly gain for Hyundai Motor's luxury arm. Volume dropped 2.7 percent at Mercedes-Benz and 14 percent at Land Rover. Most analysts forecast industry sales this year will slip below 17 million for the first time since 2014. Higher interest rates and rising new-vehicle prices are undermining consumer demand on the retail side, with the benefits of 2018's tax cuts waning and the overall U.S. economy losing some momentum. LMC last month trimmed its forecast for 2019 U.S. light-vehicle sales by 75,000 units to 16.9 million units, a decline of 2.2 percent from 2018. The company cited lower tax refunds, mixed economic data and the possibility of tariff hikes on imports. And Cox Automotive analysts expect fleet shipments, which boosted the market in 2018, will drop by 200,000 units this year. While volume is falling, new-vehicle prices continue to rise, helping pad profits at many automakers. Kelley Blue Book estimates the average transaction price for a light vehicle in the United States was $36,733 in March, up 2.3 percent year-over-year, lifted by demand for pricey full-size pickups. But when higher interest rates and tighter incentives are factored in, pushing average monthly payments up about $30 from a year earlier, price escalation “is likely contributing to the slower sales pace in the first quarter,” Kelley Blue Book said Monday. Average incentive spending in early March was tracking at $3,689 per new vehicle, a decrease from $3,903 during the same period last year, J.D. Power said. ALG estimates average incentive spending was $3,604 per vehicle in March, down $191, or 5 percent, from a year earlier, and up 0.1 percent from February 2019. 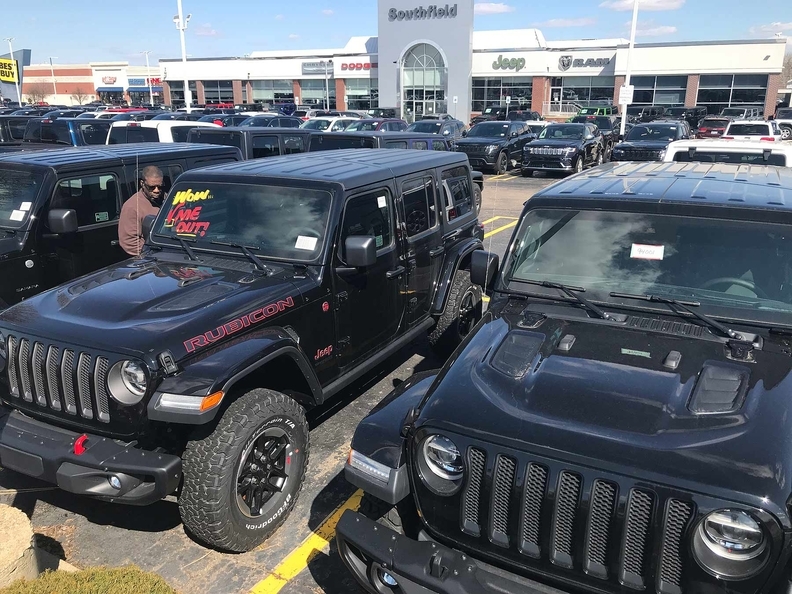 The average number of days a new vehicle sat on a dealer lot before being sold to a retail customer was 74 days through March 17, up five days from last year, J.D. Power said, signaling that inventories are growing as retail demand slips. Fleet shipments are expected to total 367,800 in March, up 2.4 percent from March 2018, J.D. Power said. Fleet volume is expected to account for 24 percent of total light-vehicle sales this year, up from 23 percent in 2018. The average interest rate on a new vehicle loan -- 6.36 percent in March -- hit the highest level in a decade, Edmunds said Tuesday, up from 5.66 percent In March 2018 and 4.44 percent five years ago. About 4 percent of all financed deals in March had zero percent interest rates, compared to 7.44 percent last year and 7.59 percent in 2014. March incentive outlays for U.S.